QMK has the ability to control RGB LEDs attached to your keyboard. 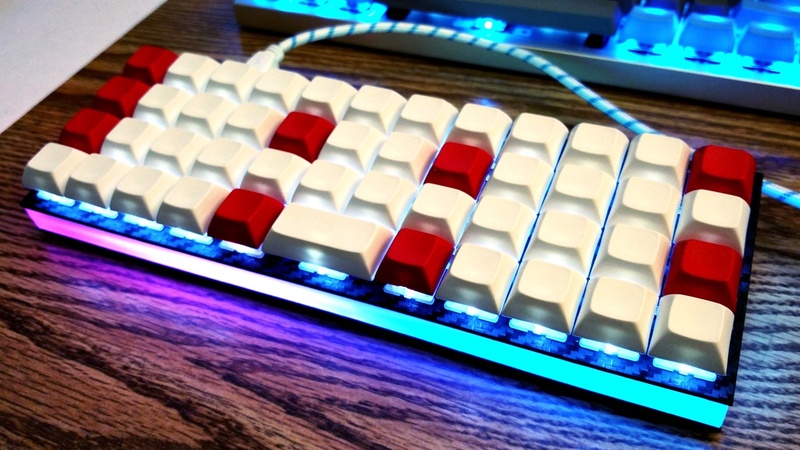 This is commonly called underglow, due to the LEDs often being mounted on the bottom of the keyboard, producing a nice diffused effect when combined with a translucent case. Some keyboards come with RGB LEDs preinstalled. Others must have them installed after the fact. See the Hardware Modification section for information on adding RGB lighting to your keyboard. WS2811, WS2812, WS2812B, WS2812C, etc. These LEDs are called "addressable" because instead of using a wire per color, each LED contains a small microchip that understands a special protocol sent over a single wire. The chip passes on the remaining data to the next LED, allowing them to be chained together. In this way, you can easily control the color of the individual LEDs. At minimum you must define the data pin your LED strip is connected to, and the number of LEDs in the strip, in your config.h. If your keyboard has onboard RGB LEDs, and you are simply creating a keymap, you usually won't need to modify these. Then you should be able to use the keycodes below to change the RGB lighting to your liking. QMK uses Hue, Saturation, and Value to select colors rather than RGB. The color wheel below demonstrates how this works. Changing the Hue cycles around the circle. Changing the Saturation moves between the inner and outer sections of the wheel, affecting the intensity of the color. Changing the Value sets the overall brightness. Check out this video for a demonstration. Note: For versions older than 0.6.117, The mode numbers were written directly. In quantum/rgblight.h there is a contrast table between the old mode number and the current symbol. If defined, enable breathing animation mode. If defined, enable rainbow mood animation mode. If defined, enable rainbow swirl animation mode. If defined, enable snake animation mode. If defined, enable knight animation mode. If defined, enable christmas animation mode. If defined, enable static gradient mode. If defined, enable RGB test animation mode. If defined, enable alternating animation mode. Here is a quick demo on Youtube (with NPKC KC60) (https://www.youtube.com/watch?v=VKrpPAHlisY). These are shorthands to popular colors. The RGB ones can be passed to the setrgb functions, while the HSV ones to the sethsv functions. These are defined in rgblight_list.h. Feel free to add to this list! If you want to make the logical order of LEDs different from the electrical connection order, you can do this by defining the RGBLIGHT_LED_MAP macro in your config.h. By defining RGBLIGHT_LED_MAP as in the example below, you can specify the LED with addressing in reverse order of the electrical connection order. For keyboards that use the RGB LEDs as a backlight for each key, you can also define it as in the example below. Using the rgblight_set_clipping_range() function, you can prepare more buffers than the actual number of LEDs, and output some of the buffers to the LEDs. This is useful if you want the split keyboard to treat left and right LEDs as logically contiguous. You can set the Clipping Range by executing the following code. In addition to setting the Clipping Range, you can use RGBLIGHT_LED_MAP together. If your keyboard lacks onboard underglow LEDs, you may often be able to solder on an RGB LED strip yourself. You will need to find an unused pin to wire to the data pin of your LED strip. Some keyboards may break out unused pins from the MCU to make soldering easier. The other two pins, VCC and GND, must also be connected to the appropriate power pins.